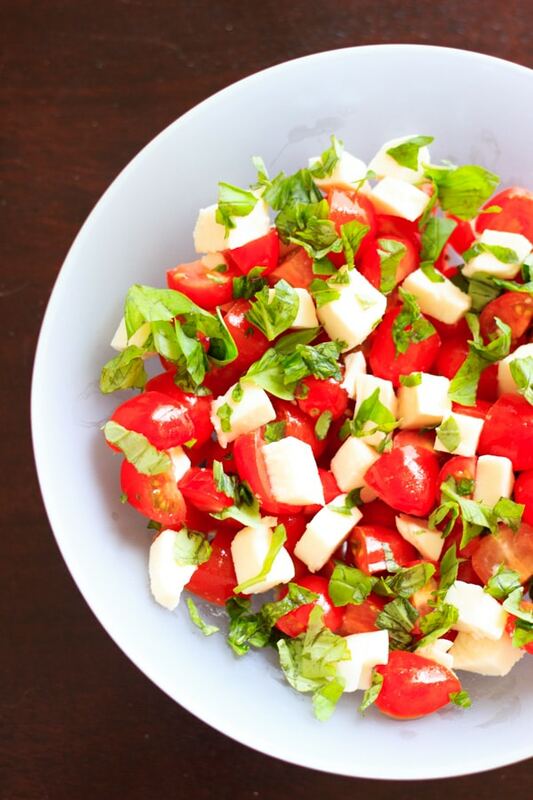 Chopped Caprese salad that takes 10 minutes and 5 ingredients to make. An easy way to enjoy this delicious gluten-free appetizer any time you want! This fresh salad will keep you coming back for more. 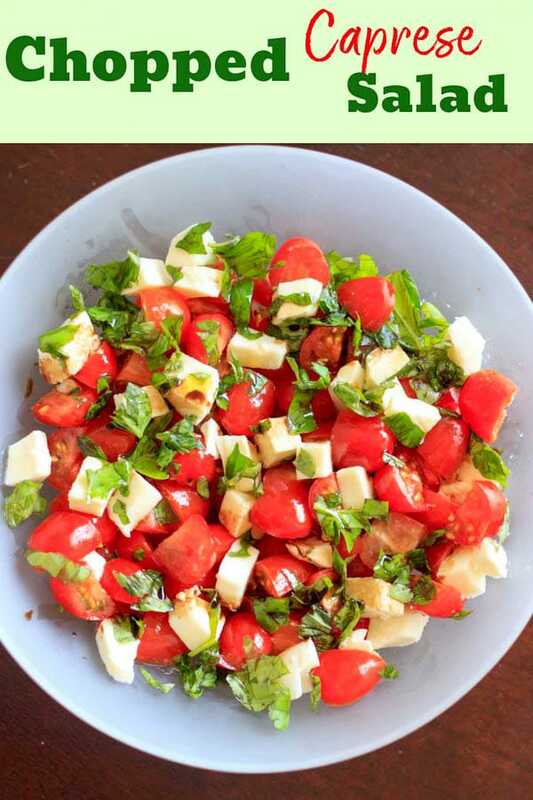 Click here to save this Caprese salad recipe on Pinterest! Confession: I’m in love with Caprese salad. Fresh mozzarella, flavorful tomato, it all just WORKS. Usually I only see this as an appetizer choice in Italian places, and I don’t get to order it often. Though let’s be honest, I have been known to eat cherry tomatoes with a handful of cheese while I stand in front of the fridge. What, am I the only one? When I realized that I could actually make a “real salad” for this, one that doesn’t require fork AND knife, I immediately went to the store to load up on tomatoes and cheese. Luckily, I have a fresh supply of basil at my doorstep. After I broke a full bottle of balsamic vinegar in the store, ran and hid (kidding, kind of), I came home to make this beautiful salad. Not the most gorgeous picture. Luckily it still tastes good, and enough so that I finished it off and immediately made a second batch that was much prettier to photograph. So again, balsamic is for DRIZZLING. Also, when I was reading other’s recipes about this chopped Caprese salad, many of them had (in my opinion) way too much oil and vinegar added. I only used 2 Tablespoons olive oil and 1 Tablespoon balsamic vinegar. One recipe called for 1/4 cup balsamic alone, which I started to do in the first batch but realized it was drowning in brown liquid. I’d recommend to start small with the oil and vinegar. You can always add more later! 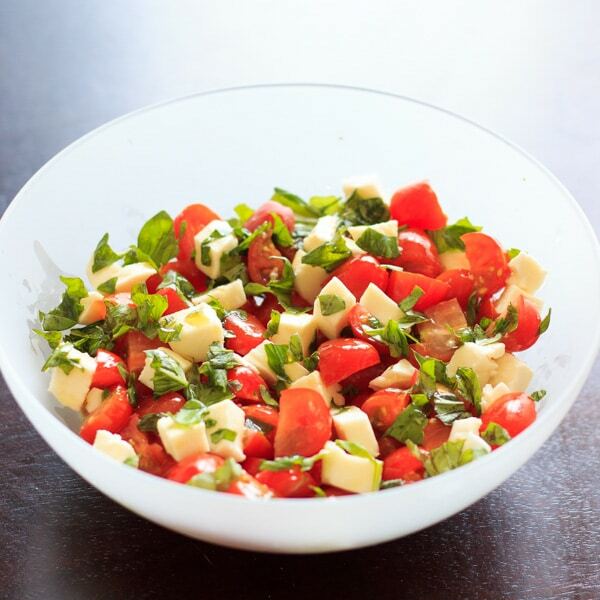 Chopped Caprese salad, 5 ingredients and ready in 10 minutes. An easy way to enjoy this delicious appetizer any time you want! This fresh salad will keep you coming back for more. 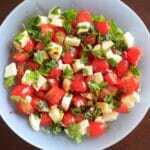 In a medium bowl, toss together the cut up tomatoes, mozzarella, and basil leaves. Add olive oil to bowl, and lightly toss together. 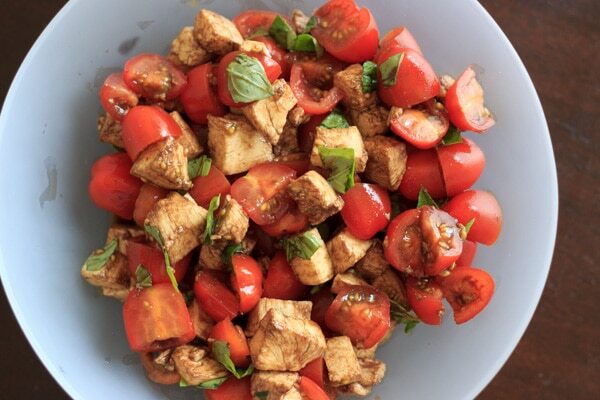 Drizzle the balsamic vinegar over the top of salad. Can add more olive oil or balsamic vinegar as desired - it's always good to start small and work your way up! Balsamic glaze is thicker and you can use either this or balsamic vinegar - even better if you want to use a little bit of both! The glaze gives it a nice finished look. Balsamic glaze, salad bowls, and herb choppers are all available in the Trial and Eater amazon shop! Thanks for the great post Kelly! I love all things Caprese & this looks PERECT! This is the ultimate summer salad in my recipe file. I love everything about this. I have even been known to add a little balsamic glaze as the finishing touch. Delicious. I love caprese salad as well! I’ve never tried it as a chopped version. I am loving this! 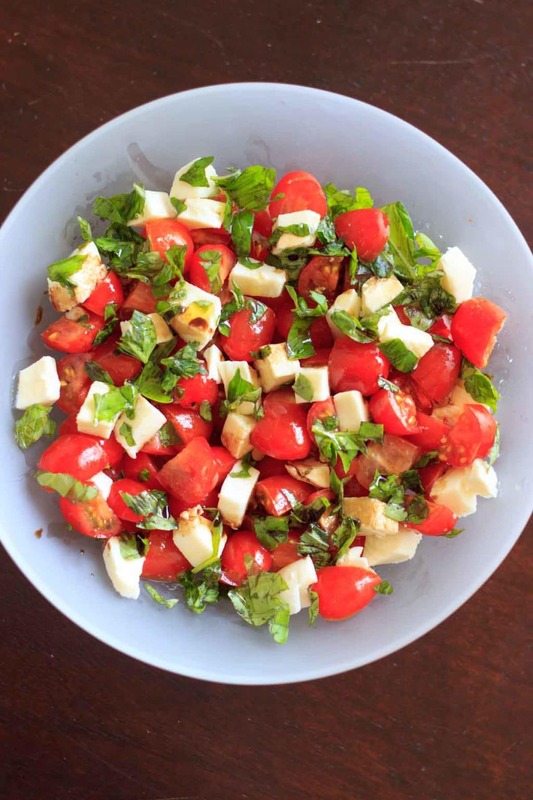 I love a great caprese salad and this one looks so pretty and fresh! Can’t go wrong with a Caprese salad in summertime! You’ve inspired me to get some basil planted myself. I’ve also definitely broken a bottle of vinegar in the market before – whoops. I have made this three times for Christmas potlucks and it has been a hit each time. Thank you for the tip of having the balsamic for drizzling . Finally a chopped version! I’ve always found the sliced version to be difficult to eat. Thanks for sharing! Just reading the replies. I am making the chopped version on Memorial day. One change…and it is fabulous. I hollow out an avocado and chop, then add to my salad. I spoon the salad into the avocado and drizzle with a balsamic reduction. Really good…and pretty. I have made that same mistake with mixing in balsamic before…lol. Still tasted great though! lol. Your pictures are beautiful! My favorite salad!!! I learned that lesson about balsamic vinegar also. Sometimes I don’t even use olive oil on this salad, just a light drizzle of vinegar. Thirty minutes . Cool and drizzle over salad after sprinkling olive oil first …..
How many servings does this recipe make? Thank you! Hadn’t had this in a lonnng time,! Then found it in a Mediterranean restaurant as a main course with cucumbers. Loved it. Can’t stop making it for an easy, light supper. Tomatoe, basil, cucumber, mozzarella balls and what’s on top? Found your post while looking up the “drizzle”. Balsamic vinegar is what I was missing. Thanks for post. We used Balsamic Dressing & mixed it in. how far in advance of service can I make this salad? Should I add oil and balsamic just before serving? I would say definitely add the balsamic right before serving or else you’ll may end up with something similar to the failed picture above! Also the fresh basil will have a tendency to wilt if you make it too far in advance. So I would say you could mix the tomatoes and cheese up to a couple days ahead, with the olive oil and salt, and then finish with the torn basil and balsamic when ready to serve. I was wondering this myself, particularly about the tomatoes getting grainy if refrigerated. I never refrigerate my tomatoes, because it changes their texture. I just mixed this up for our dinner tonite, but if I could do that earlier in the day, without losing texture, I’d like to do that. Oh my, this looks amazing!! Love anything with that flavor combo. Thank you for posting this recipe. I made it earlier this week with cherry tomatoes and basil from my garden. It was a hit, had some left over and sent it for lunch the next day. Can I use white balsamic vinegar in place of the regular brown balsamic vinegar? I’ve actually never used white balsamic, but from my research it looks like it’s more of an aesthetic choice and maybe just lightly less sweet than the dark vinegar! Thank you Kelly; I appreciate your quick response. I am actually making this salad now. I only thought of white balsamic since the mozzarella shouldn’t turn brown. Trader Joe’s has an excellent Balsamic Glaze! No need to stink up the house to reduce it yourself. I’ve recently discovered the TJ’s version as well! Caprese – YUM! I had just discovered the glaze at TJ too! Thanks for a yummy recipe! I’d never heard of white balsamic vinegar! I made this for a company potluck last year (adding romaine, to make it a larger salad for more people), and they loved it. This years Christmas potluck is coming up and they didn’t ask me what I wanted to bring, they just signed me up to bring this salad!